With the Civil War in progress, travel across the United States was difficult and dangerous. Amongst the refugees seeking to escape the hostilities were four: a gold-hunter, an army deserter, a cat-house madam and an English gentleman, four whose paths were destined to cross at the railhead. Strangers to each other, each hoping to make the last train out of Charlesburg, each with a secret. However, boarding the train was not to be the lucky break it seemed – for ahead lay confrontation with the most infamous military unit under the Southern flag – the Special Confederate Force – and gang of renegades better known as Quantrell’s Raiders who followed no rules and answered to no one in pursit of their objective. 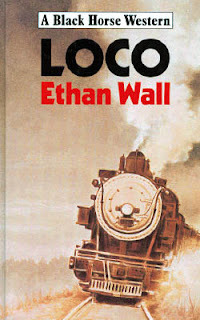 This book doesn’t have the most eye-catching of covers - or titles for that matter - and I’d have probably passed it by had I not known that Ethan Wall is one of the pseudonyms used by one of my favourite BHW writers, B.J. Holmes. Holmes creates some very memorable characters in this tale of four very different people. Each struggling to better their lives in what is becoming a desperate fight to stay alive. This writer knows how to build a story that will grip the reader from the very first page. The confrontations with both North and South armies makes for fascinating reading and when the train carrying the four is taken over by Quantrell’s Raiders the story moves up a notch, into breath taking scenes of brutality and questions of how any of the civilians can possibly survive. Well worth taking the time to find. Sounds very interesting. I'll lok out for it. This is an excellent and unusual book - read it some time back. Though I didn't know that Ethan Wall was B.J.Holmes. These Black Horse novels do westerns right. And as I mentioned on Broken Trails that cover art is always superb... another great review-thanks. B.J Holmes wrote six books as Ethan Wall. Loco was the first one.